The Israeli-Palestinian conflict remains one of the most visible political issues on campuses around the nation. 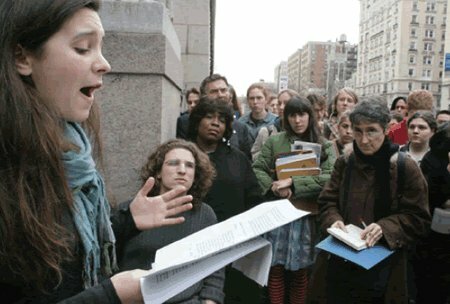 A rising level of concern about the continuing Israeli occupation of Palestinian territory (now in its fifth decade), as well as the precarious position of Israel's beleaguered Palestinian minority, have been countered by increasingly strident, even furious, attempts to silence or stifle criticism of Israeli policy on American college campuses. Tensions have been heightened especially in the wake of Israel's January 2009 re-invasion of Gaza, the consequent mobilization of protest, and the growing campaign for boycott, divestment, and sanctions. As the tide of public opinion in the United States and around the world continues to turn against Israel's policies of occupation and repression, the response to criticisms of Israeli policy on campus are growing uglier. Off-campus organizations -- many tied to the most assertive Israeli lobby in Washington -- are playing a growing role in on-campus debates. Campus activities, as a result, have been wired directly into national politics, and have become more contentious and infinitely more bitter. And the situation is likely to continue to get worse as Israel's image continues to deteriorate and as its defenders grow more anxious and resort to ever more desperate measures to turn things around. It is an extraordinary fact that no fewer than thirty-three distinct organizations-including AIPAC, the Zionist Organization of America, the American Jewish Congress, and the Jewish National Fund-are gathered together today as members or affiliates of the Israel on Campus Coalition. The coalition is an overwhelmingly powerful presence on American college campuses for which there is simply no equivalent on the Palestinian or Arab side. Its self-proclaimed mission is not merely to monitor our colleges and universities. That, after all, is the commitment of Campus Watch, which was started by pro-Israel activists in 2002. It is, rather (and in its own words), to generate "a pro-active, pro-Israel agenda on campus." There is, accordingly, disproportionate and unbalanced intervention on campuses across the country by a coalition of well-funded organizations, who have no time for -- and even less interest in -- the niceties of intellectual exchange and academic process. Insinuation, accusation, and defamation have become the weapons of first resort to respond to argument and criticism directed at Israeli policies. As far as these outside pressure groups (and their campus representatives) are concerned, the intellectual and academic price that the scholarly community pays as a result of this kind of intervention amounts to little more than collateral damage. We have become increasingly concerned at the ways in which scholarly critics of Israeli policy have been cavalierly and maliciously misrepresented, mostly through ad hominem attacks on their characters, reputations, and careers. We are troubled also by the ways in which academic programs-most notably Middle East Studies programs at major universities-are being attacked as bastions of irresponsible radicalism and anti-American activity. Our concern has been heightened especially in view of the outside pressure being brought to bear on university administrations, some of which seem to have yielded to coercion, even while trying to "balance" calls for responsibility with commitments to academic freedom. Some senior university administrators seem willing to take for granted the misrepresentations and fabrications by boisterous supporters of Israel, and have done so merely on the strident assertion of those making these claims. This is a curious position to take in the name of "balance," a notion about which we will have more to say in a moment. These are not altogether new developments, of course, as the dire threat to a number of academic careers and institutional programs in recent years, particularly in Middle East studies, will attest. Scholars whose work is critical of Israeli policies have been denied jobs, denied tenure (or faced a threat to their prospects for tenure), and in general have had their lives made difficult-not because of academic criteria, but because of political interference from extra-academic forces. Outside political intervention by those who advocate unflinching support for Israel have plunged one American program or campus after another into crisis. The University of California is only the latest in a string of such campuses, following incidents at Columbia University, Barnard College, Yale University, Wayne State University, and DePaul University. For several weeks this spring, considerable pressure was brought to bear on UCLA and especially on its Center for Near Eastern Studies. As the crisis came to a head, Stanley Kurtz, in a National Review Online article, predicted that UCLA's Center was on the way to becoming today's bête noir of the academy, just as Columbia's Middle East Studies program had been for Israel's strident supporters a few years ago. Kurtz is one of a trio (Martin Kramer and Daniel Pipes round out the group, and David Horowitz is a kind of associate) who repeatedly chide and harry academic scholars for their criticisms of Israeli policy. It is crucial to note that Kurtz's prediction was fueled by completely falsified accounts of an event the UCLA Center sponsored earlier this year, by ongoing attacks on faculty members who have spoken critically of Israeli policy, and by thoroughly misleading characterizations of them intended at the very least to make others think twice before speaking out. In January 2009, UCLA's Center for Near Eastern Studies hosted "Human Rights and Gaza," a panel discussion on campus to address the situation in Gaza in the context of human rights and international humanitarian law. One of us attended as an audience member; the other spoke on the panel, alongside professors Richard Falk, Lisa Hajjar, Gabriel Piterberg, and Susan Slymovics (as chair). Each of the panelists had published extensively on this topic, and Richard Falk is, of course, the UN Special Rapporteur on Human Rights in the occupied Palestinian territories, and hence the global authority on this matter. The panel discussion was only one of three events on Gaza that took place at UCLA around the same time. The other two, sponsored by the UCLA Israel Studies program, were explicitly intended to bring Israeli perspectives, including that of the Israeli Consul in Los Angeles, to campus, and to justify the bombardment of Gaza. "Human Rights and Gaza," by contrast, was not designed to present a Palestinian perspective (indeed, three of the five participants were Jewish, and one an Israeli); rather, it was meant to restore a sense of intellectual balance and historical context, by offering, in an academic format, a space in which established scholars could address the growing concerns (on campus and more broadly) about the human rights of a population under devastating attack by the Israeli military. That the panel was concerned with violations of human rights and international humanitarian law perhaps explains why no advocate of those violations was added to the panel (after all, advocates of legal and human rights violations are not often forthcoming). The talks by the four speakers were largely uneventful, being interrupted by pro-Israeli jeers just once and briefly. The question and discussion period grew a bit more heated and contentious. But it was hardly uncivil, save for a mostly irrelevant rant read by an insistent member of the Socialist Workers Party who refused to stop even when she was asked to by the chair, and by a couple of Israeli supporters becoming heated. This provoked one ironic and misinterpreted response from one of the panelists to a comment from the floor about the murderous nature of all Arabs (for which the panelist but not the audience member offered an apology). Now if you read the characterizations of this event published in various outlets -- from the Jewish Journal of Los Angeles to the National Review, the Wall Street Journal, and The Los Angeles Times -- you would take away a very different view of things. Repeated descriptions of the event by those who admit that they did not attend it have characterized the proceedings as akin to a "beer hall political rally" and an anti-Semitic lynch mob, and have gone so far -- by the time Stanley Kurtz joined the chorus -- as to charge the panel, apparently working on behalf of Hamas, as having led an increasingly frenzied crowd in chants of "F-ck Israel" and "Zionism is Nazism." Both of us were present throughout the entire event, we have listened in the wake of these absurd accusations to the publicly available podcasts of the talks, and we have checked with others present. Nothing could be further from the truth. A testament to the civility of the evening was made evident by the appearance of a campus policeman beside the front stage as discussion grew a little heated. His very presence seemed to cool tempers, and he exchanged smiles and greetings with some audience members. While there was applause at various points, laughter at others -- how different from most academic panels -- at no time was there chanting or invective hurled by the audience (that either of us, or anyone we talked to, witnessed) or by panelists at Israel or at any other state. No panelist called for or led the audience to chant or collectively to chastise Israel. In fact, the most uncomfortable expression of the evening was heard repeatedly at the front stage after the event had ended. A well-known Israeli provocateur from the UCLA neighborhood (neither a student nor a faculty member), who had once been involved in a scuffle with the UCLA campus rabbi (of all people), was marching up and down hissing wildly beneath her breath at one of the speakers on the panel, calling him out by first name and insisting in a tone laced with invective that he should be ashamed of himself. How, then, have hearsay, exaggeration, and sheer fabrication managed to replace a sturdy, robust account of the event based on actual facts? Two accounts of the panel were published shortly after it took place. The first was by a professional journalist writing for UCLA Today, the campus newspaper of record, on January 22. It characterized the forum as "a well-attended public event," and went on to summarize the main arguments of the papers. It made no mention of jeers, chants, or other untoward behavior (because there were none). It is remarkable that in all the discussion of the panel that has subsequently taken place, there are, as far as we can tell, only two links to this article on the entire internet. The second article, which has proliferated widely through the enchantment of the internet, was written by the education/research director of Stand With Us (one of the most vociferous components of the Israel on Campus Coalition), who sometimes identifies herself as a member of the faculty of UC Irvine (which in fact she is not). Under the headline, "Reviving 1920s Munich Beer Halls at UCLA," she presents an incoherent and rambling account of the talks that fails to convey accurately any of what was actually said (which can be easily verified by comparing her article to the podcasts of the talks at www.international.ucla.edu/cnes/podcasts). She also liberally adds unsupported and indeed unsupportable assertions and wild exaggerations into the mix (e.g., saying that the event amounted to "an academic lynching of Israel," claiming that the speakers "expressed hope that Israel would lose against Hamas," and comparing the talks by four academically distinguished and well-published scholars to "the anti-Semitic rabble rousing of 1920s Munich beer halls"). These baseless assertions (even a quick listen to the podcasts will confirm that that is what they are) have gone on to frame and color the way in which the event has been represented and characterized in almost all of the subsequent discussions. Not only has most of the subsequent discussion been based on this one article, no one relying on it has pointed out its provenance or the inherently unreliable testimony of the author, or the gap between the article and the actual talks as embodied in the live recordings publicly available to anyone in the podcasts. Thus, subsequent discussions -- by, it bears repeating, people who admit that they were not actually at the event -- have followed the pattern taken by the children's game, "telephone." A message is passed on from person to person until, having gone around the room, it bears only a passing resemblance to the original utterance. Only in this case not only does the original message (itself already faulty, given the source) deteriorate, but further layers of exaggeration and hyperbole are added to it at each pass. Judea Pearl, a professor of computer science at UCLA and one of Israel's most ardent defenders in Los Angeles, helped to ratchet up the misrepresentations of the event. Pearl began writing about the Gaza panel first in the Wall Street Journal (February 3, 2009), then in another article in the Jewish Journal of Los Angeles (February 18, 2009), and then in yet another piece, in The Los Angeles Times. In his first piece he asserts without evidence or justification that the event was essentially "a Hamas recruiting rally" intended -- by Hamas, the reader could be led to believe -- to score "another inroad into Western minds." By the time he published the piece in the Jewish Journal, Pearl had embellished his account further, adding the utterly fictitious allegation that the panelists "led the excited audience into chanting ‘Zionism is Nazism,' ‘F-ck, f-ck Israel,' in the best tradition of rhino liturgy." What is most interesting about Pearl's many accounts of the event, however, is not their hyperbolic nature, but rather the fact that he was not at the event which he has described in such lurid and varying terms in three different published accounts. His source (as he acknowledges in one of his articles, though not the others) is the Stand With Us article. Later, referring back in seamless circularity to this series of articles sealing itself from the truth, another writer in the Jewish Journal (Tom Tugend, published on February 25, 2009) comes to refer to the event as "the by now notorious UCLA symposium." Character assassination by self-referencing fabrication! The mischaracterizations and fabrications of Pearl's account, themselves building on the unsteady foundation provided by those in the Stand With Us piece, have been repeated ad nauseam by others as the gospel truth. For example, although it is highly unusual -- if not altogether unheard of -- for a university president to criticize his own faculty for expressing their views in an academic setting, in public comments at a Los Angeles synagogue the president of the University of California, Mark Yudof, did just that, chastising the scholars participating in the Center for Near Eastern Studies panel, according to what he had learned of it from Pearl's misrepresentation of the event. Stanley Kurtz's main "evidence" for his characterization of the panel in the National Review Online article also comes from Pearl. In short, the fabrications have become the public record of note, the "truth" of the matter. This broader logic, too, follows a disturbing pattern. In a campaign (initiated by an angry alumna living in a Jewish settlement in the West Bank) against a tenure case at Barnard College two years ago, professor Nadia Abu el-Haj was accused of shoddy scholarship by those who had never read her work. She was falsely charged with writing about Israeli archaeology while knowing no Hebrew, and of falsifying the history of archaeology to anchor an argument about Palestinians' historical claim to the Holy Land (she makes no such argument). Analogous mischaracterizations have been made about the scholarship of other vocal critics of Israel's policies and actions toward Palestinians, equally based on false, misleading, or nonexistent evidence -- or sheer fancy. Public fabrications of other events, including letters of complaint to chancellors, some at sister-UC campuses, have stuffed false, damaging, and demeaning language into the mouths of the critics of Israeli policy; twisted arguments and intentions to something altogether unrecognizable; and sometimes garbled, while refusing to discuss in any way, the substance of the criticisms expressed. Like a growing list of others, we have both repeatedly been subjected to "the treatment." The most recent episode of this kind of distortion involves Professor William (Bill) Robinson of the Sociology Department at UC Santa Barbara. During the Israeli bombardment of Gaza in January 2009, Robinson forwarded to his class on "Globalization and Politics" material that drew comparisons between the Nazi assault on the Warsaw Ghetto and the Israeli assault on Gaza. Two Jewish students in the class, after apparently talking with the Anti-Defamation League, filed a complaint against Robinson for "violating the Faculty Code of Conduct" and dropped the class. It turns out that Abraham Foxman, director of the Anti-Defamation League, met (under misleading pretexts) with senior UC Santa Barbara administrators and began to pressure them to investigate and censure Robinson. Foxman also apparently threatened to encourage Jewish donors to the university to withdraw their financial support unless Robinson was censured. Stand With Us -- the same outfit that played such a damaging role in the UCLA incident -- likewise became actively involved, organizing a massive letter writing campaign and threatening to bring pressure to bear to cut off donations to the campus. The most troubling aspect of this case is not that the Anti-Defamation League made the accusation or that Stand With Us jumped into the fray so eagerly, but rather that the UC Santa Barbara administration took the accusation seriously, and apparently succumbed to outside political pressure to have Professor Robinson investigated (http://sb4af.wordpress.com). Evidence mounted of numerous violations of university procedures in the conduct of the investigation. This included, most disturbingly, key committee members (themselves known supporters of Israeli policy) discussing the case privately with Foxman who, it should be emphasized, had no standing to be involved in the investigation at all. And yet the investigation apparently pressed on, in the face of mounting faculty, student, and external criticism of the university's violations of academic freedom and of its own investigative policies. It was only in mid-June 2009, six months after the case was initiated, that Professor Robinson received notice that all charges against him were being dropped. No reason was cited, but the remarkable mobilization of students and faculty against the investigation -- culminating in an uncontested UC Santa Barbara Academic Senate vote to investigate the administration's own mishandling of the entire affair -- no doubt played a key role. We should all find alarming that what is taking place in the academy today is an extension of what takes place on Capitol Hill and in the corridors of (real) power. What is at stake is the process of representation, which shapes memory, disposition, and arguably -- in the long run at any rate -- the policy process itself. Many of the same tactics are being used in both situations; and they share the aim to monopolize legitimacy by tarnishing all criticism and questioning it as inherently illegitimate and malevolent. It is worth pointing out that those who resort to the sorts of unbridled and unfounded charges exemplified by the attacks on the UCLA Gaza panel or the Robinson affair at UC Santa Barbara rarely if ever actually engage the arguments of Israel's critics. Counter-arguments are hardly ever mounted, counter-evidence almost never thought necessary. The rhetoric of response is predictable, and it takes the shape of the familiar litany of exhausted assertions that are inevitably recited en bloc, without any reference to what is actually being said; what evidence is being offered; what reasons, arguments, facts, figures, and citations are being assembled. Thus any criticism of Israel and Zionism is treated as criticism of Jews (even if made by Jews, who are then obviously self-hating), and therefore anti-Semitic or worse, as Judea Pearl asserts in his piece in the Los Angeles Times of March 15, 2009. Israel is merely protecting the security of its people; any state under rocket attack would do the same. Hamas, like Hezbollah, is a terrorist organization and Israel, like the United States, has the right to protect itself by all means necessary (a right that in such accounts the Palestinians never seem to possess). And it's not fair-or, better yet, it's inherently anti-Semitic-to single out Israel for criticism when there are places in the world that are far less democratic and far more violent toward their residents than Israel (Darfur, the cause célèbre of many pro-Israeli organizations, is often trotted out as an example, though usually without it being noted that the United States does not support, arm, and subsidize the Sudanese government or give its illegal actions political cover in the UN Security Council, let alone that there is no one in the United States -- much less dozens of well-funded organizations and an armada of campus outfits -- actively condoning the atrocities in Darfur). It is not surprising, then, given its provenance, that the Stand With Us report on "Gaza and Human Rights" expresses what pro-Israel campus activists refer to using the Hebrew word "hasbara." This means, essentially if not literally, "propaganda." The Hasbara Handbook: Promoting Israel on Campus, which is distributed to campus activists by organizations like Stand With Us (e.g., click "Guides for Activists" on www.middle-east-info.org), explains that it is often better to score points than to engage in actual arguments, and offers an explanation for how, in its own words, "to score points whilst avoiding debate." Point-scoring, the Hasbara Handbook explains, "works because most audience members fail to analyze what they hear. Rather, they register only a key few points, and form a vague ‘impression' of whose argument was stronger." Part of the strategy is to recycle the same claims over and again, in as many settings as possible. "If people hear something often enough," the document points out, "they come to believe it." This is precisely, almost to the letter, the approach taken by most of the attacks on scholarly critics of Israeli policy. It matters little what is actually being discussed by critics; the familiar stock-in-trade responses will be brought to bear to terminate the discussion. Or a campaign to silence the critics will be promoted by making life uncomfortable for them or threatening the withdrawal of support for their institutions, or most extremely threatening their very careers, or their very employability (as happened with Norman Finkelstein at DePaul). The less successful the initial attempt to close things down, the louder the next round of condemnation, the more heated the invective, the more extreme the charges, the more gratuitous the escalation. Thus escalates the crescendo of attacks aimed at the UCLA panelists, which now basically has them taking orders directly from Hamas, and leading a chanting mob of anti-Semites. We have both been subjected to similar accusations, in person and in print, mangling what we mean, putting words in our mouths we neither uttered nor thought, meanly misquoting or decontextualizing or partially citing what we write. It matters not that we have repeatedly and publicly endorsed nonviolent forms of protest and counter-action to Israel's violence; that we believe in justice, law, and human rights; that we would have all the people in the promised land enjoy its promise rather than some suffer strangulation at the hands of the others. Why then can strident supporters of Israel repeatedly resort to these tactics and be taken so seriously without engaging-indeed, while altogether avoiding-actual debate? Critics of the critics of Israeli policy repeatedly call for "balance," assuming that every panel by their opponents -- but not the ones they organize themselves -- should have counter-voices. Of course, the fact that every one-sided panel may be countered by one equally one-sided on the other side suggests that campuses can achieve a broader semblance of balance in other ways, as UCLA Chancellor Gene Block rightly noted in response to attempts by Israel's supporters to silence Israel's critics. We don't hear too many calls for economics departments having to hire Marxist political economists, or (in the opposite political direction) biology departments having to hire intelligent designers, in the name of "balance." Not to worry, we are not attempting to open up new cans of worms! We mean only to point out how one-sided the calls in the case of Israel-Palestine are, how unbalanced in the name of balance. Indeed, how off-balance. We certainly don't recall hearing from these quarters any condemnation of the one-sidedness of, say, Alan Dershowitz. Nor do we hear at a minimum any expression of concern by those so volubly condemning Hamas rockets fired at southern Israel for the devastation wrought by the Israeli bombardment of civilian men, women, and children taking shelter in schools and UN compounds during the recent assault on Gaza. And when Benny Morris, Israel's most renowned revisionist historian, famously insists that if you have to kill or be killed, it would be better to kill, we hear no pro-Israeli voices objecting in the name of "balance" that these are hardly the only options. Posing the issues reductively and solely as ones of survival in terms of physical self-defense so skews the issues as to essentially end the possibility of any debate. But perhaps that's the very point of the claim (as the Hasbara Handbook points out). When President Jimmy Carter was invited to speak by various campuses, including one of our own, after the publication of his book Palestine: Peace Not Apartheid, Alan Dershowitz insisted in the name of "balance" that he share the stage or follow the former president's appearance. No doubt Professor Dershowitz speaks to many groups on his own, pushing his one-sided position. We don't hear calls that his audiences have access to an immediate counter-view. If balance is required in public of a former U.S. president, is it not also to be applied to a "one-sided" professor? And then what -- every lecture on every issue on every campus is to be followed by a counter-lecture? The very idea is absurd. Likewise perhaps with public forums such as National Review Online. In his article, Stanley Kurtz makes a good deal of the lack of balance by public forums giving voice to Israel's critics. And yet he does so in a forum hardly known for publishing pro-Palestinian pieces. Be careful what you call for! In The Trial, Kafka writes that "the charges are never made frivolously, and that the Court, once it has brought a charge against someone, is firmly convinced of the guilt of the accused and can be dislodged from that conviction only with the greatest difficulty." Israel's campus critics are accused without notice, condemned without evidence, convicted without recourse, and sentenced without representation. Israel's most vocal American proponents serve as policeman and accuser, judge and jury. In the end, those convicted are reduced to nothing more than shadow figures, straw persons set afire by the flaming terms of accusation. Those undertaking to place off bounds all criticism of the Israeli state or military regarding treatment of Palestinians by automatically and offhandedly denouncing such criticism as anti-Semitic trivialize any legitimate charge of real anti-Semitism. This accusatory trivialization confronts such strident supporters with a quandary. They seek to de-exceptionalize Israel by insisting that critics do not equally condemn Sudan or China or North Korea for violations of human rights. And yet they exceptionalize the Israeli state by seeking to shield it from any criticism whatsoever. No good ever comes from a state rendered or rendering itself immune from criticism, as the instances cited by Israel's supporters prove without qualification. True to our nature, however, academics as such should live to push ideas, to press difficult points, to debate the ins and outs. As Edward Said repeatedly pointed out, academics and intellectuals have a responsibility not just to speak in clearly articulated ways but also to air ideas even about difficult subjects, to venture where others might avoid going. The misrepresentations formulated by Israel's most vociferous supporters are designed to narrow not just what can be said about a subject but what subject matter can be raised at all. The misrepresentations, the implied silencing, and the insidious implications are not simply pernicious; they seem obviously designed to quash any criticism of Israeli policy. In short, such intervention has the effect of undercutting the very idea of the university. * discount the numbers of dead or injured or the innocence of the dead or injured among those regarded as "the enemy" while justifying the devastation produced by the action in question as "necessary" even if the effects were "unfortunate." One other point. There have long been academic centers and teaching programs for Jewish Studies, as well as Middle Eastern, Near Eastern, Arab, and Islamic Studies. In the past, the best of those institutional formations have looked to engage-and to engage across personal and political divides, precisely-the complex relations marked by the segregating political conditions. More recently, as the separationist politics and their ideological rationalizations have hardened on the ground, academic programs have begun to mirror these isolating conditions. For instance, there have begun to emerge programs or research centers solely in Israel Studies, funded largely by private endowments, tending to ignore or lament or rationalize away the relation between conditions in Israel and those in the Occupied Territories. Such programs attempt to consider Israel as though it could be framed as an object of study in isolation from the Palestinians (who make up a fifth of its own population and half of the total population over which Israel rules) and the whole question of Palestine, to both of which Israel is in fact inexorably tied. Imagine trying to frame an American studies program today that consciously (or, worse, unconsciously) excludes any treatment of blacks or Hispanics. Given the complex constitution of the region, accordingly, we consider it imperative that any teaching or research program about Israel-Palestine take seriously the complex and interacting ways that social, cultural, political, legal, and epistemological arrangements are deeply intertwined, that conditions of life and death for some turn relationally on those for others. This entails a different way of thinking not just about the region but also more about institutions of knowledge formation and their institutional arrangements than tends to be the dominant trend today. Tikkun has occupied an extraordinarily important progressive and productive position amid the intellectual and political tensions. We consider Tikkun and the communities it is able to reach and address uniquely well-placed, accordingly, to promote a set of forums -- whether online, in print, or face-to-face-designed to promote civil, respectful, but critical engagements across the political divides. Such forums would (and already do) provide the platforms to air difficult positions about the Israel-Palestine divide, to critique and counter-critique without being maligned, and to discuss alternative arrangements without fear of being reduced to ridicule, invective, or even threat. Such forums would be well-placed to establish ground rules and guidelines for criticizing political programs and practices, as well as their supporters and critics, civilly and without engaging in a witch hunt as a consequence of the criticism aired. They would establish the standards similarly for unacceptable disparagement of Jews and of Palestinians, as well as of critics of Israel and the Palestinian cause. And they would set the example for distinguishing between acceptable criticism of Israel's actions and policies and anti-Semitic criticism of Jews as such. This example, in turn, would have the effect of encouraging the major representatives of the Anti-Defamation League to return to its historically crucial role of monitoring not only anti-Semitism but also all forms of bigotry, without reducing criticism of Israel of necessity to anti-Semitism. To put off the table crucial counter-considerations is to unbalance consideration of the alternatives. A forum dominated by those who can shout loudest, have more access, have more resources, or feel more insulted is one-sided and, in the end, destructive. One-sided, self-regarding assertion is no exchange at all. In the final analysis it does no one any good, least of all the people suffering the consequences, on pretty much all sides of the divide. We call, by contrast, for engaging the arguments, for respecting the right to say difficult things, countering without abuse, making criticisms and counter-criticisms without mischievous mischaracterization. Without hasbara. In calling for respectful exchange, for critical engagement, then, we are calling for respecting the positions taken by honest thinkers. In insisting on balance and recalibration, we are agreeing to balance in all the complexity, on all registers and dimensions. The lives at stake-all the lives-are owed nothing less. David Theo Goldberg directs the system-wide University of California Humanities Research Institute (www.uchri.org) and is a professor of comparative literature and criminology, law, and society at UC Irvine. Saree Makdisi is a professor of English and comparative literature at UCLA. Correction: the article originally characterized Martin Kramer along with Stanley Kurtz and Daniel Pipes as "non-academics" but Martin Kramer was in fact a tenured senior academic faculty member at Tel Aviv University, where he is now emeritus. Our apologies to Dr. Kramer.